A crab and cream cheese pâté with gin and topped with butter. Perfect with lightly toasted crusty bread. High in omega-3. 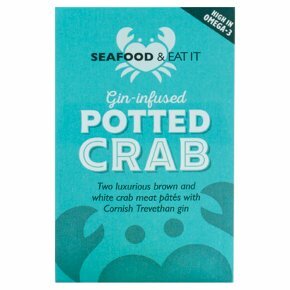 Two luxurious brown and white crab meat pâtés with Cornish Trevethan gin Introducing our indulgent potted crab. Made with the finest native crab from Cornwall and the British Isles, Trevethan Cornish gin, topped with butter and a scattering of juniper berries & pink peppercorns. Perfect for lunch on hot toast.